Timber extraction work adjacent to the route means we’ve created a diversion. Click the button for full information. 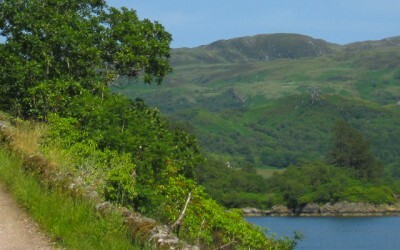 The Loch Lomond & Cowal Way in Argyll is known as ‘Scotland in 57 miles’. Less than one hour from Glasgow International Airport and Glasgow city centre, this accessible part of the Scottish Highlands offers beautiful coastlines, dramatic scenery, engaging heritage, abundant wildlife, and very friendly communities and people. Since 2015 £750,000 has been invested in new path infrastructure, business development services, and promotion. Loch Lomond & Cowal Way is now one of the UK’s best long distance routes, suitable primarily for walkers and runners, and also mountain bikers. Established in 2000, the Loch Lomond & Cowal Way is Scotland’s most diverse long distance footpath. It runs the length of the Cowal Peninsula, passing through some of the most beautiful and varied landscape in the Highlands. The Loch Lomond & Cowal Way begins at Portavadie in the south of Cowal and winds its way up through the peninsula to end at Inveruglas at Loch Lomond, passing through the communities of Tighnabruaich, Glendaruel, Strachur, Lochgoilhead and Arrochar. The route makes use of existing footpaths, forestry tracks, hillsides, quiet roads and traditional rights of way. The views are varied and stunning, including shorelines, forests, hills and lochs. 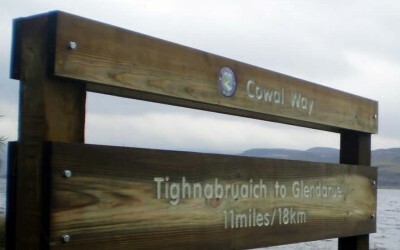 Now one of Scotland’s Great Trails, this quiet and waymarked path also connects with the West Highland Way, Scotland’s most famous long distance route..
We are pleased to announce that we have received significant funding from the Coastal Communities Fund to improve our 57 mile long distance footpath.